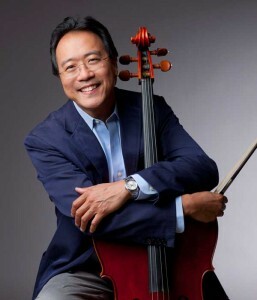 The Bermuda Festival has confirmed that celebrated cellist and 15-time Grammy award winner Yo-Yo Ma [pictured] has accepted an invitation to perform at the 40th Bermuda Festival of the Performing Arts. “This is quite a coup for the Festival as Mr. Ma is perhaps the greatest living cellist, and is in huge demand around the world,” remarked Ian Davidson, Festival Chairman. “It is a real honour and a testament to both Bermuda and the Festival itself, that he has accepted our invitation.”. Mr. Davidson continued: “Yo-Yo Ma is highly regarded not only for his formidable talent but for his desire to share the joy of his music-making with the world. “His Silk Road Ensemble connects the world’s neighbourhoods, breaks boundaries of ethnicity and era, and mixes the modern and the traditional, for the delight of all. “Mr. Ma is also widely recognised for his strong commitment to educational programmes that bring the world into the classroom and the classroom into the world. Karen Pollard, the Artistic Director for the Festival said, “As this is our Ruby Anniversary, we wanted to honour the Festival’s three founders, Lord Menuhin, former Governor Sir Edwin Leather and Mr. John Ellison. Ms. Pollard continued, “His recital will be on February 1, 2015 at 5.00pm at Earl Cameron Theatre at City Hall, when he will perform the Bach Cello Suites Nos. 1, 3 and 5, his recording of which won him a Grammy Award. Tickets will be available on bermudafestival.org and bdatix.bm . The dates for the 40th Anniversary Bermuda Festival are January 23rd, 2015 through to March 8th, 2015 and the full 2015 Bermuda Festival line-up will be announced shortly. YO YO MAMA SO BIG! I will definitely be going to this! Is Bobby McFerrin still around? Yes – he does a workshop each summer at Omega Institute. OMG! What a coup! Congratulations Bermuda Festival! Too bad the venue is so small, that event will fill up in minutes. And we all know the best tickets are going to the sponsors. AMAZING! Good work landing that Bermuda! I bet it costs $150+ for a ticket though being YO YO MA is there….